Structures of some common lipids. At the top are cholesterol and oleic acid. The middle structure is a triglyceride composed of oleoyl, stearoyl, and palmitoyl chains attached to a glycerol backbone. At the bottom is the common phospholipid phosphatidylcholine. In biology, lipids comprise a group of naturally occurring molecules that include fats, waxes, sterols, fat-soluble vitamins (such as vitamins A, D, E, and K), monoglycerides, diglycerides, triglycerides, phospholipids, and others. The main biological functions of lipids include storing energy, signaling, and acting as structural components of cell membranes. Lipids have applications in the cosmetic and food industries as well as in nanotechnology. Scientists may broadly define lipids as hydrophobic or amphiphilic small molecules; the amphiphilic nature of some lipids allows them to form structures such as vesicles, multilamellar/unilamellar liposomes, or membranes in an aqueous environment. Biological lipids originate entirely or in part from two distinct types of biochemical subunits or "building-blocks": ketoacyl and isoprene groups. Using this approach, lipids may be divided into eight categories: fatty acids, glycerolipids, glycerophospholipids, sphingolipids, saccharolipids, and polyketides (derived from condensation of ketoacyl subunits); and sterol lipids and prenol lipids (derived from condensation of isoprene subunits). Although the term lipid is sometimes used as a synonym for fats, fats are a subgroup of lipids called triglycerides. Lipids also encompass molecules such as fatty acids and their derivatives (including tri-, di-, monoglycerides, and phospholipids), as well as other sterol-containing metabolites such as cholesterol. Although humans and other mammals use various biosynthetic pathways both to break down and to synthesize lipids, some essential lipids cannot be made this way and must be obtained from the diet. The word lipid stems etymologically from the Greek lipos (fat). Fatty acids, or fatty acid residues when they are part of a lipid, are a diverse group of molecules synthesized by chain-elongation of an acetyl-CoA primer with malonyl-CoA or methylmalonyl-CoA groups in a process called fatty acid synthesis. They are made of a hydrocarbon chain that terminates with a carboxylic acid group; this arrangement confers the molecule with a polar, hydrophilic end, and a nonpolar, hydrophobic end that is insoluble in water. The fatty acid structure is one of the most fundamental categories of biological lipids, and is commonly used as a building-block of more structurally complex lipids. The carbon chain, typically between four and 24 carbons long, may be saturated or unsaturated, and may be attached to functional groups containing oxygen, halogens, nitrogen, and sulfur. If a fatty acid contains a double bond, there is the possibility of either a cis or trans geometric isomerism, which significantly affects the molecule's configuration. Cis-double bonds cause the fatty acid chain to bend, an effect that is compounded with more double bonds in the chain. Three double bonds in 18-carbon linolenic acid, the most abundant fatty-acyl chains of plant thylakoid membranes, render these membranes highly fluid despite environmental low-temperatures, and also makes linolenic acid give dominating sharp peaks in high resolution 13-C NMR spectra of chloroplasts. This in turn plays an important role in the structure and function of cell membranes. Most naturally occurring fatty acids are of the cis configuration, although the trans form does exist in some natural and partially hydrogenated fats and oils. Examples of biologically important fatty acids include the eicosanoids, derived primarily from arachidonic acid and eicosapentaenoic acid, that include prostaglandins, leukotrienes, and thromboxanes. Docosahexaenoic acid is also important in biological systems, particularly with respect to sight. Other major lipid classes in the fatty acid category are the fatty esters and fatty amides. Fatty esters include important biochemical intermediates such as wax esters, fatty acid thioester coenzyme A derivatives, fatty acid thioester ACP derivatives and fatty acid carnitines. The fatty amides include N-acyl ethanolamines, such as the cannabinoid neurotransmitter anandamide. Glycerolipids are composed of mono-, di-, and tri-substituted glycerols, the best-known being the fatty acid triesters of glycerol, called triglycerides. The word "triacylglycerol" is sometimes used synonymously with "triglyceride". In these compounds, the three hydroxyl groups of glycerol are each esterified, typically by different fatty acids. Because they function as an energy store, these lipids comprise the bulk of storage fat in animal tissues. The hydrolysis of the ester bonds of triglycerides and the release of glycerol and fatty acids from adipose tissue are the initial steps in metabolizing fat. Additional subclasses of glycerolipids are represented by glycosylglycerols, which are characterized by the presence of one or more sugar residues attached to glycerol via a glycosidic linkage. Examples of structures in this category are the digalactosyldiacylglycerols found in plant membranes and seminolipid from mammalian sperm cells. Glycerophospholipids, usually referred to as phospholipids, are ubiquitous in nature and are key components of the lipid bilayer of cells, as well as being involved in metabolism and cell signaling. Neural tissue (including the brain) contains relatively high amounts of glycerophospholipids, and alterations in their composition has been implicated in various neurological disorders. Glycerophospholipids may be subdivided into distinct classes, based on the nature of the polar headgroup at the sn-3 position of the glycerol backbone in eukaryotes and eubacteria, or the sn-1 position in the case of archaebacteria. Examples of glycerophospholipids found in biological membranes are phosphatidylcholine (also known as PC, GPCho or lecithin), phosphatidylethanolamine (PE or GPEtn) and phosphatidylserine (PS or GPSer). In addition to serving as a primary component of cellular membranes and binding sites for intra- and intercellular proteins, some glycerophospholipids in eukaryotic cells, such as phosphatidylinositols and phosphatidic acids are either precursors of or, themselves, membrane-derived second messengers. Typically, one or both of these hydroxyl groups are acylated with long-chain fatty acids, but there are also alkyl-linked and 1Z-alkenyl-linked (plasmalogen) glycerophospholipids, as well as dialkylether variants in archaebacteria. Sphingolipids are a complicated family of compounds that share a common structural feature, a sphingoid base backbone that is synthesized de novo from the amino acid serine and a long-chain fatty acyl CoA, then converted into ceramides, phosphosphingolipids, glycosphingolipids and other compounds. The major sphingoid base of mammals is commonly referred to as sphingosine. Ceramides (N-acyl-sphingoid bases) are a major subclass of sphingoid base derivatives with an amide-linked fatty acid. The fatty acids are typically saturated or mono-unsaturated with chain lengths from 16 to 26 carbon atoms. The major phosphosphingolipids of mammals are sphingomyelins (ceramide phosphocholines), whereas insects contain mainly ceramide phosphoethanolamines and fungi have phytoceramide phosphoinositols and mannose-containing headgroups. The glycosphingolipids are a diverse family of molecules composed of one or more sugar residues linked via a glycosidic bond to the sphingoid base. Examples of these are the simple and complex glycosphingolipids such as cerebrosides and gangliosides. 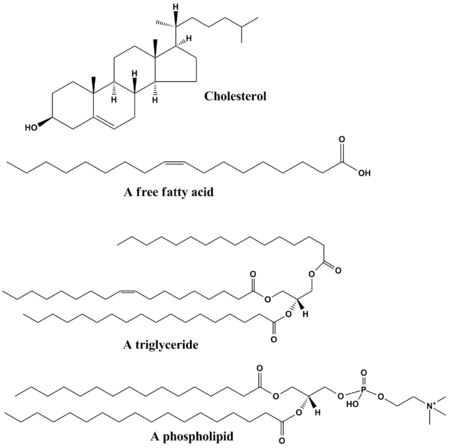 Sterol lipids, such as cholesterol and its derivatives, are an important component of membrane lipids, along with the glycerophospholipids and sphingomyelins. The steroids, all derived from the same fused four-ring core structure, have different biological roles as hormones and signaling molecules. The eighteen-carbon (C18) steroids include the estrogen family whereas the C19 steroids comprise the androgens such as testosterone and androsterone. The C21 subclass includes the progestogens as well as the glucocorticoids and mineralocorticoids. The secosteroids, comprising various forms of vitamin D, are characterized by cleavage of the B ring of the core structure. Other examples of sterols are the bile acids and their conjugates, which in mammals are oxidized derivatives of cholesterol and are synthesized in the liver. The plant equivalents are the phytosterols, such as β-sitosterol, stigmasterol, and brassicasterol; the latter compound is also used as a biomarker for algal growth. The predominant sterol in fungal cell membranes is ergosterol. Prenol lipids are synthesized from the five-carbon-unit precursors isopentenyl diphosphate and dimethylallyl diphosphate that are produced mainly via the mevalonic acid (MVA) pathway. The simple isoprenoids (linear alcohols, diphosphates, etc.) are formed by the successive addition of C5 units, and are classified according to number of these terpene units. Structures containing greater than 40 carbons are known as polyterpenes. Carotenoids are important simple isoprenoids that function as antioxidants and as precursors of vitamin A. Another biologically important class of molecules is exemplified by the quinones and hydroquinones, which contain an isoprenoid tail attached to a quinonoid core of non-isoprenoid origin. Vitamin E and vitamin K, as well as the ubiquinones, are examples of this class. Prokaryotes synthesize polyprenols (called bactoprenols) in which the terminal isoprenoid unit attached to oxygen remains unsaturated, whereas in animal polyprenols (dolichols) the terminal isoprenoid is reduced. Structure of the saccharolipid Kdo2-lipid A. Glucosamine residues in blue, Kdo residues in red, acyl chains in black and phosphate groups in green. 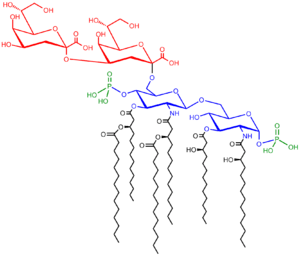 Saccharolipids describe compounds in which fatty acids are linked directly to a sugar backbone, forming structures that are compatible with membrane bilayers. In the saccharolipids, a monosaccharide substitutes for the glycerol backbone present in glycerolipids and glycerophospholipids. The most familiar saccharolipids are the acylated glucosamine precursors of the Lipid A component of the lipopolysaccharides in Gram-negative bacteria. Typical lipid A molecules are disaccharides of glucosamine, which are derivatized with as many as seven fatty-acyl chains. The minimal lipopolysaccharide required for growth in E. coli is Kdo2-Lipid A, a hexa-acylated disaccharide of glucosamine that is glycosylated with two 3-deoxy-D-manno-octulosonic acid (Kdo) residues. Polyketides are synthesized by polymerization of acetyl and propionyl subunits by classic enzymes as well as iterative and multimodular enzymes that share mechanistic features with the fatty acid synthases. They comprise a large number of secondary metabolites and natural products from animal, plant, bacterial, fungal and marine sources, and have great structural diversity. Many polyketides are cyclic molecules whose backbones are often further modified by glycosylation, methylation, hydroxylation, oxidation, and/or other processes. Many commonly used anti-microbial, anti-parasitic, and anti-cancer agents are polyketides or polyketide derivatives, such as erythromycins, tetracyclines, avermectins, and antitumor epothilones. Eukaryotic cells feature compartmentalized membrane-bound organelles that carry out different biological functions. The glycerophospholipids are the main structural component of biological membranes, such as the cellular plasma membrane and the intracellular membranes of organelles; in animal cells the plasma membrane physically separates the intracellular components from the extracellular environment. The glycerophospholipids are amphipathic molecules (containing both hydrophobic and hydrophilic regions) that contain a glycerol core linked to two fatty acid-derived "tails" by ester linkages and to one "head" group by a phosphate ester linkage. While glycerophospholipids are the major component of biological membranes, other non-glyceride lipid components such as sphingomyelin and sterols (mainly cholesterol in animal cell membranes) are also found in biological membranes. In plants and algae, the galactosyldiacylglycerols, and sulfoquinovosyldiacylglycerol, which lack a phosphate group, are important components of membranes of chloroplasts and related organelles and are the most abundant lipids in photosynthetic tissues, including those of higher plants, algae and certain bacteria. Plant thylakoid membranes have the largest lipid component of a non-bilayer forming monogalactosyl diglyceride (MGDG), and little phospholipids; despite this unique lipid composition, chloroplast thylakoid membranes have been shown to contain a dynamic lipid-bilayer matrix as revealed by magnetic resonance and electron microscope studies. Self-organization of phospholipids: a spherical liposome, a micelle, and a lipid bilayer. A biological membrane is a form of lamellar phase lipid bilayer. The formation of lipid bilayers is an energetically preferred process when the glycerophospholipids described above are in an aqueous environment. This is known as the hydrophobic effect. In an aqueous system, the polar heads of lipids align towards the polar, aqueous environment, while the hydrophobic tails minimize their contact with water and tend to cluster together, forming a vesicle; depending on the concentration of the lipid, this biophysical interaction may result in the formation of micelles, liposomes, or lipid bilayers. Other aggregations are also observed and form part of the polymorphism of amphiphile (lipid) behavior. Phase behavior is an area of study within biophysics and is the subject of current academic research. Micelles and bilayers form in the polar medium by a process known as the hydrophobic effect. When dissolving a lipophilic or amphiphilic substance in a polar environment, the polar molecules (i.e., water in an aqueous solution) become more ordered around the dissolved lipophilic substance, since the polar molecules cannot form hydrogen bonds to the lipophilic areas of the amphiphile. So in an aqueous environment, the water molecules form an ordered "clathrate" cage around the dissolved lipophilic molecule. The formation of lipids into protocell membranes represents a key step in models of abiogenesis, the origin of life. Triglycerides, stored in adipose tissue, are a major form of energy storage both in animals and plants. The adipocyte, or fat cell, is designed for continuous synthesis and breakdown of triglycerides in animals, with breakdown controlled mainly by the activation of hormone-sensitive enzyme lipase. The complete oxidation of fatty acids provides high caloric content, about 9 kcal/g, compared with 4 kcal/g for the breakdown of carbohydrates and proteins. Migratory birds that must fly long distances without eating use stored energy of triglycerides to fuel their flights. In recent years, evidence has emerged showing that lipid signaling is a vital part of the cell signaling. Lipid signaling may occur via activation of G protein-coupled or nuclear receptors, and members of several different lipid categories have been identified as signaling molecules and cellular messengers. These include sphingosine-1-phosphate, a sphingolipid derived from ceramide that is a potent messenger molecule involved in regulating calcium mobilization, cell growth, and apoptosis; diacylglycerol (DAG) and the phosphatidylinositol phosphates (PIPs), involved in calcium-mediated activation of protein kinase C; the prostaglandins, which are one type of fatty-acid derived eicosanoid involved in inflammation and immunity; the steroid hormones such as estrogen, testosterone and cortisol, which modulate a host of functions such as reproduction, metabolism and blood pressure; and the oxysterols such as 25-hydroxy-cholesterol that are liver X receptor agonists. Phosphatidylserine lipids are known to be involved in signaling for the phagocytosis of apoptotic cells and/or pieces of cells. They accomplish this by being exposed to the extracellular face of the cell membrane after the inactivation of flippases which place them exclusively on the cytosolic side and the activation of scramblases, which scramble the orientation of the phospholipids. After this occurs, other cells recognize the phosphatidylserines and phagocytosize the cells or cell fragments exposing them. The "fat-soluble" vitamins (A, D, E and K) – which are isoprene-based lipids – are essential nutrients stored in the liver and fatty tissues, with a diverse range of functions. Acyl-carnitines are involved in the transport and metabolism of fatty acids in and out of mitochondria, where they undergo beta oxidation. Polyprenols and their phosphorylated derivatives also play important transport roles, in this case the transport of oligosaccharides across membranes. Polyprenol phosphate sugars and polyprenol diphosphate sugars function in extra-cytoplasmic glycosylation reactions, in extracellular polysaccharide biosynthesis (for instance, peptidoglycan polymerization in bacteria), and in eukaryotic protein N-glycosylation. Cardiolipins are a subclass of glycerophospholipids containing four acyl chains and three glycerol groups that are particularly abundant in the inner mitochondrial membrane. They are believed to activate enzymes involved with oxidative phosphorylation. Lipids also form the basis of steroid hormones. The major dietary lipids for humans and other animals are animal and plant triglycerides, sterols, and membrane phospholipids. The process of lipid metabolism synthesizes and degrades the lipid stores and produces the structural and functional lipids characteristic of individual tissues. In animals, when there is an oversupply of dietary carbohydrate, the excess carbohydrate is converted to triglycerides. This involves the synthesis of fatty acids from acetyl-CoA and the esterification of fatty acids in the production of triglycerides, a process called lipogenesis. Fatty acids are made by fatty acid synthases that polymerize and then reduce acetyl-CoA units. The acyl chains in the fatty acids are extended by a cycle of reactions that add the acetyl group, reduce it to an alcohol, dehydrate it to an alkene group and then reduce it again to an alkane group. The enzymes of fatty acid biosynthesis are divided into two groups, in animals and fungi all these fatty acid synthase reactions are carried out by a single multifunctional protein, while in plant plastids and bacteria separate enzymes perform each step in the pathway. The fatty acids may be subsequently converted to triglycerides that are packaged in lipoproteins and secreted from the liver. The synthesis of unsaturated fatty acids involves a desaturation reaction, whereby a double bond is introduced into the fatty acyl chain. For example, in humans, the desaturation of stearic acid by stearoyl-CoA desaturase-1 produces oleic acid. The doubly unsaturated fatty acid linoleic acid as well as the triply unsaturated α-linolenic acid cannot be synthesized in mammalian tissues, and are therefore essential fatty acids and must be obtained from the diet. Triglyceride synthesis takes place in the endoplasmic reticulum by metabolic pathways in which acyl groups in fatty acyl-CoAs are transferred to the hydroxyl groups of glycerol-3-phosphate and diacylglycerol. Beta oxidation is the metabolic process by which fatty acids are broken down in the mitochondria and/or in peroxisomes to generate acetyl-CoA. For the most part, fatty acids are oxidized by a mechanism that is similar to, but not identical with, a reversal of the process of fatty acid synthesis. That is, two-carbon fragments are removed sequentially from the carboxyl end of the acid after steps of dehydrogenation, hydration, and oxidation to form a beta-keto acid, which is split by thiolysis. The acetyl-CoA is then ultimately converted into ATP, CO2, and H2O using the citric acid cycle and the electron transport chain. Hence the citric acid cycle can start at acetyl-CoA when fat is being broken down for energy if there is little or no glucose available. The energy yield of the complete oxidation of the fatty acid palmitate is 106 ATP. Unsaturated and odd-chain fatty acids require additional enzymatic steps for degradation. Most of the fat found in food is in the form of triglycerides, cholesterol, and phospholipids. Some dietary fat is necessary to facilitate absorption of fat-soluble vitamins (A, D, E, and K) and carotenoids. Humans and other mammals have a dietary requirement for certain essential fatty acids, such as linoleic acid (an omega-6 fatty acid) and alpha-linolenic acid (an omega-3 fatty acid) because they cannot be synthesized from simple precursors in the diet. Both of these fatty acids are 18-carbon polyunsaturated fatty acids differing in the number and position of the double bonds. Most vegetable oils are rich in linoleic acid (safflower, sunflower, and corn oils). Alpha-linolenic acid is found in the green leaves of plants, and in selected seeds, nuts, and legumes (in particular flax, rapeseed, walnut, and soy). Fish oils are particularly rich in the longer-chain omega-3 fatty acids eicosapentaenoic acid (EPA) and docosahexaenoic acid (DHA). A large number of studies have shown positive health benefits associated with consumption of omega-3 fatty acids on infant development, cancer, cardiovascular diseases, and various mental illnesses, such as depression, attention-deficit hyperactivity disorder, and dementia. In contrast, it is now well-established that consumption of trans fats, such as those present in partially hydrogenated vegetable oils, are a risk factor for cardiovascular disease. A few studies have suggested that total dietary fat intake is linked to an increased risk of obesity and diabetes. However, a number of very large studies, including the Women's Health Initiative Dietary Modification Trial, an eight-year study of 49,000 women, the Nurses' Health Study and the Health Professionals Follow-up Study, revealed no such links. None of these studies suggested any connection between percentage of calories from fat and risk of cancer, heart disease, or weight gain. The Nutrition Source, a website maintained by the Department of Nutrition at the Harvard School of Public Health, summarizes the current evidence on the impact of dietary fat: "Detailed research—much of it done at Harvard—shows that the total amount of fat in the diet isn't really linked with weight or disease." ↑ Maitland, Jr Jones (1998). Organic Chemistry. W W Norton & Co Inc (Np). p. 139. ISBN 978-0-393-97378-5. 1 2 3 Fahy E, Subramaniam S, Murphy RC, Nishijima M, Raetz CR, Shimizu T, Spener F, van Meer G, Wakelam MJ, Dennis EA (April 2009). "Update of the LIPID MAPS comprehensive classification system for lipids". Journal of Lipid Research. 50 Suppl (S1): S9–14. doi:10.1194/jlr.R800095-JLR200. PMC 2674711 . PMID 19098281. ↑ Subramaniam S, Fahy E, Gupta S, Sud M, Byrnes RW, Cotter D, Dinasarapu AR, Maurya MR (October 2011). "Bioinformatics and systems biology of the lipidome". Chemical Reviews. 111 (10): 6452–90. doi:10.1021/cr200295k. PMC 3383319 . PMID 21939287. ↑ Mashaghi S, Jadidi T, Koenderink G, Mashaghi A (February 2013). "Lipid nanotechnology". International Journal of Molecular Sciences. 14 (2): 4242–82. doi:10.3390/ijms14024242. PMC 3588097 . PMID 23429269. ↑ Vance JE, Vance DE (2002). Biochemistry of Lipids, Lipoproteins and Membranes. Amsterdam: Elsevier. ISBN 978-0-444-51139-3. ↑ Brown HA, ed. (2007). Lipodomics and Bioactive Lipids: Mass Spectrometry Based Lipid Analysis. Methods in Enzymology. 423. Boston: Academic Press. ISBN 978-0-12-373895-0. ↑ Hunt SM, Groff JL, Gropper SA (1995). Advanced Nutrition and Human Metabolism. Belmont, California: West Pub. Co. p. 98. ISBN 978-0-314-04467-9. ↑ Yashroy RC. (1987). "13C NMR studies of lipid fatty acyl chains of chloroplast membranes". Indian Journal of Biochemistry and Biophysics. 24 (6): 177–178. ↑ Hunter JE (November 2006). "Dietary trans fatty acids: review of recent human studies and food industry responses". Lipids. 41 (11): 967–92. doi:10.1007/s11745-006-5049-y. PMID 17263298. ↑ Furse S (2011-12-02). "A Long Lipid, a Long Name: Docosahexaenoic Acid". The Lipid Chronicles. ↑ "DHA for Optimal Brain and Visual Functioning". DHA/EPA Omega-3 Institute. ↑ Fezza F, De Simone C, Amadio D, Maccarrone M (2008). "Fatty acid amide hydrolase: a gate-keeper of the endocannabinoid system". Sub-Cellular Biochemistry. Subcellular Biochemistry. 49: 101–32. doi:10.1007/978-1-4020-8831-5_4. ISBN 978-1-4020-8830-8. PMID 18751909. ↑ Coleman RA, Lee DP (March 2004). "Enzymes of triacylglycerol synthesis and their regulation". Progress in Lipid Research. 43 (2): 134–76. doi:10.1016/S0163-7827(03)00051-1. PMID 14654091. ↑ van Holde and Mathews, pp. 630–31. 1 2 Hölzl G, Dörmann P (September 2007). "Structure and function of glycoglycerolipids in plants and bacteria". Progress in Lipid Research. 46 (5): 225–43. doi:10.1016/j.plipres.2007.05.001. PMID 17599463. ↑ Honke K, Zhang Y, Cheng X, Kotani N, Taniguchi N (2004). "Biological roles of sulfoglycolipids and pathophysiology of their deficiency". Glycoconjugate Journal. 21 (1-2): 59–62. doi:10.1023/B:GLYC.0000043749.06556.3d. PMID 15467400. ↑ "The Structure of a Membrane". The Lipid Chronicles. Retrieved 2011-12-31. ↑ Berridge MJ, Irvine RF (September 1989). "Inositol phosphates and cell signalling". Nature. 341 (6239): 197–205. doi:10.1038/341197a0. PMID 2550825. ↑ Farooqui AA, Horrocks LA, Farooqui T (June 2000). "Glycerophospholipids in brain: their metabolism, incorporation into membranes, functions, and involvement in neurological disorders". Chemistry and Physics of Lipids. 106 (1): 1–29. doi:10.1016/S0009-3084(00)00128-6. PMID 10878232. ↑ Ivanova PT, Milne SB, Byrne MO, Xiang Y, Brown HA (2007). "Glycerophospholipid identification and quantitation by electrospray ionization mass spectrometry". Methods in Enzymology. Methods in Enzymology. 432: 21–57. doi:10.1016/S0076-6879(07)32002-8. ISBN 978-0-12-373895-0. PMID 17954212. ↑ van Holde and Mathews, p. 844. ↑ Paltauf F (December 1994). "Ether lipids in biomembranes". Chemistry and Physics of Lipids. 74 (2): 101–39. doi:10.1016/0009-3084(94)90054-X. PMID 7859340. ↑ Merrill AH, Sandoff K (2002). "Chapter 14: Sphingolipids: Metabolism and Cell Signaling" (PDF). In Vance JE, Vance EE. Biochemistry of Lipids, Lipoproteins and Membranes (4th ed.). Amsterdam: Elsevier. pp. 373–407. ISBN 978-0-444-51138-6. ↑ Hori T, Sugita M (1993). "Sphingolipids in lower animals". Progress in Lipid Research. 32 (1): 25–45. doi:10.1016/0163-7827(93)90003-F. PMID 8415797. ↑ Wiegandt H (January 1992). "Insect glycolipids". Biochimica et Biophysica Acta. 1123 (2): 117–26. doi:10.1016/0005-2760(92)90101-Z. PMID 1739742. ↑ Guan X, Wenk MR (May 2008). "Biochemistry of inositol lipids". Frontiers in Bioscience. 13 (13): 3239–51. doi:10.2741/2923. PMID 18508430. ↑ Bach D, Wachtel E (March 2003). "Phospholipid/cholesterol model membranes: formation of cholesterol crystallites". Biochimica et Biophysica Acta. 1610 (2): 187–97. doi:10.1016/S0005-2736(03)00017-8. PMID 12648773. ↑ Stryer et al., p. 749. ↑ Bouillon R, Verstuyf A, Mathieu C, Van Cromphaut S, Masuyama R, Dehaes P, Carmeliet G (December 2006). "Vitamin D resistance". Best Practice & Research. Clinical Endocrinology & Metabolism. 20 (4): 627–45. doi:10.1016/j.beem.2006.09.008. PMID 17161336. ↑ Russell DW (2003). "The enzymes, regulation, and genetics of bile acid synthesis". Annual Review of Biochemistry. 72: 137–74. doi:10.1146/annurev.biochem.72.121801.161712. PMID 12543708. ↑ Villinski JC, Hayes JM, Brassell SC, Riggert VL, Dunbar R (2008). "Sedimentary sterols as biogeochemical indicators in the Southern Ocean". Organic Geochemistry. 39 (5): 567–588. doi:10.1016/j.orggeochem.2008.01.009. ↑ Deacon J. (2005). Fungal Biology. Cambridge, Massachusetts: Blackwell Publishers. p. 342. ISBN 978-1-4051-3066-0. 1 2 3 Kuzuyama T, Seto H (April 2003). "Diversity of the biosynthesis of the isoprene units". Natural Product Reports. 20 (2): 171–83. doi:10.1039/b109860h. PMID 12735695. ↑ Rao AV, Rao LG (March 2007). "Carotenoids and human health". Pharmacological Research. 55 (3): 207–16. doi:10.1016/j.phrs.2007.01.012. PMID 17349800. ↑ Brunmark A, Cadenas E (1989). "Redox and addition chemistry of quinoid compounds and its biological implications". Free Radical Biology & Medicine. 7 (4): 435–77. doi:10.1016/0891-5849(89)90126-3. PMID 2691341. ↑ Swiezewska E, Danikiewicz W (July 2005). "Polyisoprenoids: structure, biosynthesis and function". Progress in Lipid Research. 44 (4): 235–58. doi:10.1016/j.plipres.2005.05.002. PMID 16019076. 1 2 Raetz CR, Garrett TA, Reynolds CM, Shaw WA, Moore JD, Smith DC, et al. (May 2006). "Kdo2-Lipid A of Escherichia coli, a defined endotoxin that activates macrophages via TLR-4". Journal of Lipid Research. 47 (5): 1097–111. doi:10.1194/jlr.M600027-JLR200. PMID 16479018. ↑ Walsh CT (March 2004). "Polyketide and nonribosomal peptide antibiotics: modularity and versatility". Science. 303 (5665): 1805–10. doi:10.1126/science.1094318. PMID 15031493. ↑ Caffrey P, Aparicio JF, Malpartida F, Zotchev SB (2008). "Biosynthetic engineering of polyene macrolides towards generation of improved antifungal and antiparasitic agents". Current Topics in Medicinal Chemistry. 8 (8): 639–53. doi:10.2174/156802608784221479. PMID 18473889. ↑ Minto RE, Blacklock BJ (July 2008). "Biosynthesis and function of polyacetylenes and allied natural products". Progress in Lipid Research. 47 (4): 233–306. doi:10.1016/j.plipres.2008.02.002. PMC 2515280 . PMID 18387369. ↑ Yashroy RC. (1990). "Magnetic resonance studies of dynamic organisation of lipids in chloroplast membranes". Journal of Biosciences. 15 (4): 281–288. doi:10.1007/BF02702669. ↑ van Meer G, Voelker DR, Feigenson GW (February 2008). "Membrane lipids: where they are and how they behave". Nature Reviews. Molecular Cell Biology. 9 (2): 112–24. doi:10.1038/nrm2330. PMC 2642958 . PMID 18216768. ↑ Feigenson GW (November 2006). "Phase behavior of lipid mixtures". Nature Chemical Biology. 2 (11): 560–3. doi:10.1038/nchembio1106-560. PMC 2685072 . PMID 17051225. ↑ Wiggins PM (December 1990). "Role of water in some biological processes". Microbiological Reviews. 54 (4): 432–49. PMC 372788 . PMID 2087221. ↑ Raschke TM, Levitt M (May 2005). "Nonpolar solutes enhance water structure within hydration shells while reducing interactions between them". Proceedings of the National Academy of Sciences of the United States of America. 102 (19): 6777–82. doi:10.1073/pnas.0500225102. PMC 1100774 . PMID 15867152. ↑ Segré D, Ben-Eli D, Deamer DW, Lancet D (2001). "The lipid world" (PDF). Origins of Life and Evolution of the Biosphere. 31 (1-2): 119–45. doi:10.1023/A:1006746807104. PMID 11296516. ↑ Brasaemle DL (December 2007). "Thematic review series: adipocyte biology. The perilipin family of structural lipid droplet proteins: stabilization of lipid droplets and control of lipolysis". Journal of Lipid Research. 48 (12): 2547–59. doi:10.1194/jlr.R700014-JLR200. PMID 17878492. ↑ Wang X (June 2004). "Lipid signaling". Current Opinion in Plant Biology. 7 (3): 329–36. doi:10.1016/j.pbi.2004.03.012. PMID 15134755. ↑ Dinasarapu AR, Saunders B, Ozerlat I, Azam K, Subramaniam S (June 2011). "Signaling gateway molecule pages--a data model perspective". Bioinformatics. 27 (12): 1736–8. doi:10.1093/bioinformatics/btr190. PMC 3106186 . PMID 21505029. ↑ Eyster KM (March 2007). "The membrane and lipids as integral participants in signal transduction: lipid signal transduction for the non-lipid biochemist". Advances in Physiology Education. 31 (1): 5–16. doi:10.1152/advan.00088.2006. PMID 17327576. ↑ Hinkovska-Galcheva V, VanWay SM, Shanley TP, Kunkel RG (November 2008). "The role of sphingosine-1-phosphate and ceramide-1-phosphate in calcium homeostasis". Current Opinion in Investigational Drugs. 9 (11): 1192–205. PMID 18951299. ↑ Saddoughi SA, Song P, Ogretmen B (2008). "Roles of bioactive sphingolipids in cancer biology and therapeutics". Sub-Cellular Biochemistry. Subcellular Biochemistry. 49: 413–40. doi:10.1007/978-1-4020-8831-5_16. ISBN 978-1-4020-8830-8. PMC 2636716 . PMID 18751921. ↑ Klein C, Malviya AN (January 2008). "Mechanism of nuclear calcium signaling by inositol 1,4,5-trisphosphate produced in the nucleus, nuclear located protein kinase C and cyclic AMP-dependent protein kinase". Frontiers in Bioscience. 13 (13): 1206–26. doi:10.2741/2756. PMID 17981624. ↑ Boyce JA (August 2008). "Eicosanoids in asthma, allergic inflammation, and host defense". Current Molecular Medicine. 8 (5): 335–49. doi:10.2174/156652408785160989. PMID 18691060. ↑ Bełtowski J (2008). "Liver X receptors (LXR) as therapeutic targets in dyslipidemia". Cardiovascular Therapeutics. 26 (4): 297–316. doi:10.1111/j.1755-5922.2008.00062.x. PMID 19035881. ↑ Biermann M, Maueröder C, Brauner JM, Chaurio R, Janko C, Herrmann M, Muñoz LE (December 2013). "Surface code--biophysical signals for apoptotic cell clearance". Physical Biology. 10 (6): 065007. doi:10.1088/1478-3975/10/6/065007. PMID 24305041. ↑ Indiveri C, Tonazzi A, Palmieri F (October 1991). "Characterization of the unidirectional transport of carnitine catalyzed by the reconstituted carnitine carrier from rat liver mitochondria". Biochimica et Biophysica Acta. 1069 (1): 110–6. doi:10.1016/0005-2736(91)90110-t. PMID 1932043. ↑ Parodi AJ, Leloir LF (April 1979). "The role of lipid intermediates in the glycosylation of proteins in the eucaryotic cell". Biochimica et Biophysica Acta. 559 (1): 1–37. doi:10.1016/0304-4157(79)90006-6. PMID 375981. ↑ Helenius A, Aebi M (March 2001). "Intracellular functions of N-linked glycans". Science. 291 (5512): 2364–9. doi:10.1126/science.291.5512.2364. PMID 11269317. ↑ Nowicki M, Müller F, Frentzen M (April 2005). "Cardiolipin synthase of Arabidopsis thaliana". FEBS Letters. 579 (10): 2161–5. doi:10.1016/j.febslet.2005.03.007. PMID 15811335. ↑ Gohil VM, Greenberg ML (February 2009). "Mitochondrial membrane biogenesis: phospholipids and proteins go hand in hand". The Journal of Cell Biology. 184 (4): 469–72. doi:10.1083/jcb.200901127. PMC 2654137 . PMID 19237595. ↑ Hoch FL (March 1992). "Cardiolipins and biomembrane function". Biochimica et Biophysica Acta. 1113 (1): 71–133. doi:10.1016/0304-4157(92)90035-9. PMID 1550861. ↑ Chirala SS, Wakil SJ (November 2004). "Structure and function of animal fatty acid synthase". Lipids. 39 (11): 1045–53. doi:10.1007/s11745-004-1329-9. PMID 15726818. ↑ White SW, Zheng J, Zhang YM (2005). "The structural biology of type II fatty acid biosynthesis". Annual Review of Biochemistry. 74: 791–831. doi:10.1146/annurev.biochem.74.082803.133524. PMID 15952903. ↑ Ohlrogge JB, Jaworski JG (June 1997). "Regulation of fatty acid synthesis". Annual Review of Plant Physiology and Plant Molecular Biology. 48: 109–136. doi:10.1146/annurev.arplant.48.1.109. PMID 15012259. 1 2 Stryer et al., p. 643. ↑ Grochowski LL, Xu H, White RH (May 2006). "Methanocaldococcus jannaschii uses a modified mevalonate pathway for biosynthesis of isopentenyl diphosphate". Journal of Bacteriology. 188 (9): 3192–8. doi:10.1128/JB.188.9.3192-3198.2006. PMC 1447442 . PMID 16621811. ↑ Lichtenthaler HK (June 1999). "The 1-dideoxy-D-xylulose-5-phosphate pathway of isoprenoid biosynthesis in plants". Annual Review of Plant Physiology and Plant Molecular Biology. 50: 47–65. doi:10.1146/annurev.arplant.50.1.47. PMID 15012203. 1 2 Schroepfer GJ (1981). "Sterol biosynthesis". Annual Review of Biochemistry. 50: 585–621. doi:10.1146/annurev.bi.50.070181.003101. PMID 7023367. ↑ Lees ND, Skaggs B, Kirsch DR, Bard M (March 1995). "Cloning of the late genes in the ergosterol biosynthetic pathway of Saccharomyces cerevisiae--a review". Lipids. 30 (3): 221–6. doi:10.1007/BF02537824. PMID 7791529. ↑ Russo GL (March 2009). "Dietary n-6 and n-3 polyunsaturated fatty acids: from biochemistry to clinical implications in cardiovascular prevention". Biochemical Pharmacology. 77 (6): 937–46. doi:10.1016/j.bcp.2008.10.020. PMID 19022225. ↑ Riediger ND, Othman RA, Suh M, Moghadasian MH (April 2009). "A systemic review of the roles of n-3 fatty acids in health and disease". Journal of the American Dietetic Association. 109 (4): 668–79. doi:10.1016/j.jada.2008.12.022. PMID 19328262. ↑ Galli C, Risé P (2009). "Fish consumption, omega 3 fatty acids and cardiovascular disease. The science and the clinical trials". Nutrition and Health. 20 (1): 11–20. doi:10.1177/026010600902000102. PMID 19326716. ↑ Micha R, Mozaffarian D (2008). "Trans fatty acids: effects on cardiometabolic health and implications for policy". Prostaglandins, Leukotrienes, and Essential Fatty Acids. 79 (3-5): 147–52. doi:10.1016/j.plefa.2008.09.008. PMC 2639783 . PMID 18996687. ↑ Dalainas I, Ioannou HP (April 2008). "The role of trans fatty acids in atherosclerosis, cardiovascular disease and infant development". International Angiology. 27 (2): 146–56. PMID 18427401. ↑ Mozaffarian D, Willett WC (December 2007). "Trans fatty acids and cardiovascular risk: a unique cardiometabolic imprint?". Current Atherosclerosis Reports. 9 (6): 486–93. doi:10.1007/s11883-007-0065-9. PMID 18377789. ↑ Astrup A (February 2005). "The role of dietary fat in obesity". Seminars in Vascular Medicine. 5 (1): 40–7. doi:10.1055/s-2005-871740. PMID 15968579. ↑ Astrup A (2008). "Dietary management of obesity". JPEN. Journal of Parenteral and Enteral Nutrition. 32 (5): 575–7. doi:10.1177/0148607108321707. PMID 18753397. ↑ Beresford SA, Johnson KC, Ritenbaugh C, Lasser NL, Snetselaar LG, Black HR, et al. (February 2006). "Low-fat dietary pattern and risk of colorectal cancer: the Women's Health Initiative Randomized Controlled Dietary Modification Trial". Journal of the American Medical Association. 295 (6): 643–54. doi:10.1001/jama.295.6.643. PMID 16467233. ↑ Howard BV, Manson JE, Stefanick ML, Beresford SA, Frank G, Jones B, Rodabough RJ, Snetselaar L, Thomson C, Tinker L, Vitolins M, Prentice R (January 2006). "Low-fat dietary pattern and weight change over 7 years: the Women's Health Initiative Dietary Modification Trial". Journal of the American Medical Association. 295 (1): 39–49. doi:10.1001/jama.295.1.39. PMID 16391215. ↑ "Fats and Cholesterol: Out with the Bad, In with the Good — What Should You Eat? – The Nutrition Source". Harvard School of Public Health. Devlin TM (1997). Textbook of Biochemistry: With Clinical Correlations (4th ed.). Chichester: John Wiley & Sons. ISBN 978-0-471-17053-2.
van Holde KE, Mathews CK (1996). Biochemistry (2nd ed.). Menlo Park, California: Benjamin/Cummings Pub. Co. ISBN 978-0-8053-3931-4. Look up lipid in Wiktionary, the free dictionary. Wikimedia Commons has media related to Lipids. Cyberlipid.org – Resources and history for lipids. LIPID MAPS – Comprehensive lipid and lipid-associated gene/protein databases. LipidBank – Japanese database of lipids and related properties, spectral data and references. National Lipid Association – Professional medical education organization for health care professionals who seek to prevent morbidity and mortality stemming from dyslipidemias and other cholesterol-related disorders.